Which Star Wars: The Force Awakens Scene Does J.J. Abrams Regret? Star Wars: The Force Awakens is less than a month away from hitting the home market, where some fans will undoubtedly troll through the sequel frame by frame to find as many mistakes as possible. But quite a few die hard Star Wars fanatics didn't have to watch the movie more than once to realize there was something off about the movie's ending. And it's one of audience's biggest gripes with the blockbuster. 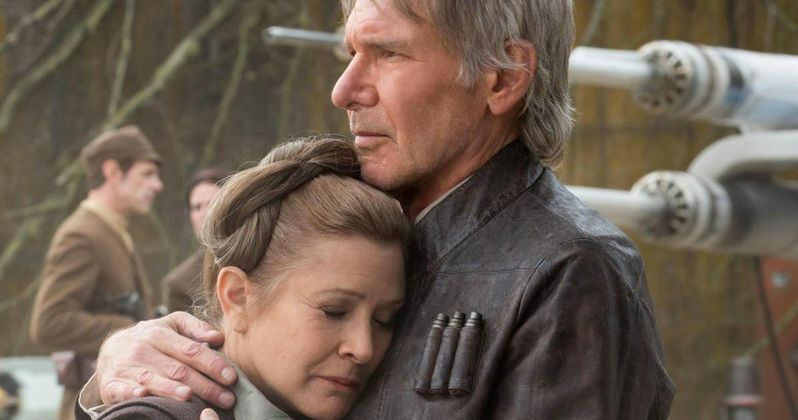 Why did General Leia snub Chewbacca to hug Rey? It didn't make any sense. Now, director J.J. Abrams looks back on this moment with regret, and admits, he made a mistake. There will be SPOILERS ahead. The moment in question happens as the big third act of the movie comes to a close. The galaxy has just lost a great smuggle and pilot in Han Solo. The man was killed at the hands of his own son, and Chewbacca is in mourning. The Wookie arrives back at the Resistance Base, where General Leia awaits. The two have a great history shared between them. Chewy is Han's co-pilot and best mate. Leia is Han's ex-wife, former lover and mother of their son. But instead of comforting her old friend, she instead goes to hug Rey, someone she has never met in her life. Why does this happen? J.J. Abrams recently caught up with /film, where this sore subject was discussed at length. Chewbacca is obviously distraught about the death of his lifelong friend. So why don't Leia and Chewy acknowledge this loss between them? Here's what the director had to say about making what he calls a mistake. "That was probably one of the mistakes I made in that. My thinking at the time was that Chewbacca, despite the pain he was feeling, was focused on trying to save Finn and getting him taken care of. So I tried to have Chewbacca go off with him and focus on Rey, and then have Rey find Leia and Leia find Rey. The idea being that both of them being strong with the Force and never having met, would know about each other - that Leia would have been told about her beyond what we saw onscreen and Rey of course would have learned about Leia. And that reunion would be a meeting and a reunion all in one, and a sort of commiseration of their mutual loss." Director J.J. Abrams goes onto to blame the moment on the way he blocked the shot. Because he feels the moment shared between Rey and Leia is an important one. He wouldn't take that out of the movie, or change it. But perhaps the lead up could have been executed better. He explains. We're not sure if this explanation will bring any peace of mind to fans. After all, the moment between Chewbacca and Leia is lost forever. As the immediate grieving period will have passed by the next time we see both of them. General Leia stayed back at the Resistance Base while Chewbacca and R2-D2 accompanied Rey to Luke's Jedi retreat. Many have wondered why Leia sought out Rey in the first place. Many believe this is an indication that Leia knows Rey, and knows of her lineage. Is she Aunt Leia? We might not get those answers for a long time. But it would certainly make more sense if Leia had previous knowledge of the girl's existence. From Abrams' comments, we know that Leia can feel the force flowing through Rey, and is drawn to her by that connection. Director Rian Johnson promises some of these questions will be further answered in Star Wars: Episode VIII.